New novels are like recipes you haven’t tried before. You’ve stirred and simmered a bunch of ingredients together in a pot and your reluctant dinner guests will be the guinea pigs. Poison? Or ambrosia? I am always amazed at how blind I am to my own work. I fall madly and utterly in love with the novels I write. Case in point: I’ve just finished a Y/A novel, The Faery Queen of New World Underhill. If I were a teenager I’d devour it (and in my secret heart of hearts I shall remain a teenage girl forever). But the world doesn’t live inside my brain. It will be some time before the book comes out. There is a long list of people to impress, first: my agent, who isn’t convinced this is a good sell, publishers, editors, and then, of course, readers like you. I’m meditating on the problem of new work lately as I’m also in development with yet another novel. Like an alchemist I’m scribbling symbols onto a page and gathering my quicksilver to create the magical elixir that will turn lead into gold, words into sales. 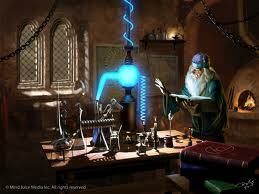 My only hope is that, like all the great alchemists (or cooks), I’m a passionate believer in magic. Where there is a spark of life someone will have interest, even if it’s just a fellow alchemist.